In Thailand, traditional cushions in many shapes and sizes are used throughout the home.
. Thai Tatami Reed is of recent origin as the reed is being cultivated in Thailand. Please use the links on the left to browse through the many styles of silk, cotton and tatami reed cushions. In a Thai home, where furniture is kept to the minimum to keep space open and allow the free flow of air, pillows and cushions serve as essential commodities for people who spend most part of their lives on the well-scrubbed wooden floor. 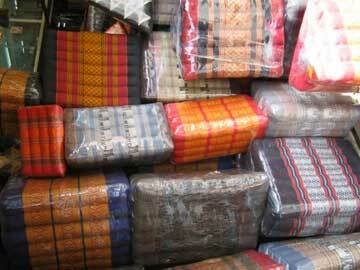 Pillows and cushions in a Thai home come in all sizes and shapes. They vary according to their uses, not the fantasy and imagination of the makers. Most common and typical among Thai pillows and cushions is the mon khwan , literally "axe pillow", with reference to its triangular shape, resembling the blade of an axe. It is a supportive cushion for those sitting on the floor, on a reed mat or a short-legged, large table called tang in Thai. Triangular cushion has become an indispensable part of leisure life in a Thai home, and even in the dwelling of Buddhist monks. It is not unusual to find a large triangular cushion among the annual offerings to the temple in a Kathin ceremony. To make sure that the triangular cushions remain in shape and serve their any triangular cushions stitched and stuffed in a simple manner. They consist either three or six small triangles, each supporting and bracing the others. Cushions are often ornately embroidered, or made up of beautiful brocades. They are, unlike pillows, not wrapped in cases. In some ethnic communities in the Northeast, there exist patterns that are identified with the people, intricately woven mainly for decorative cushions to be presented as gifts to the temples and for household use. The province of Yasothon, with a large population of former migrants across the Mekong River, boasts the mon khit cushion decorated with patterned has become a symbol of Thai arts and crafts as well.